Even so something has gone wrong…. Your phone rings minutes after you hit the Send button. It’s that dreaded call – the call that makes you throw up a little in your mouth before answering. Someone has discovered an error in the campaign, and it’s too late for you to do anything about it. Or is it? No matter how rigorous your review process, or how careful you have been, mistakes do happen. 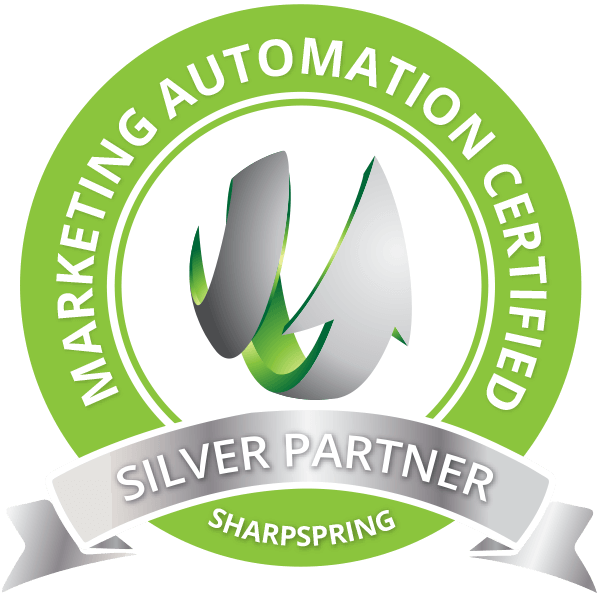 Email marketing, and the email production process itself, has become more complex. There are many moving parts in it is inevitable that errors occur. It is inevitable there are edits that occur during each round of reviews. We make these edits and upload again. It has happened that someone did edits on the live version of email in the sending platform. And someone else also did edits before the first person’s edits saved. The first person presumes their edits saved and sends out the campaign. These are less than ideal circumstances, but in the rush to send a time-sensitive campaign, these things do happen. The campaign sent out without the final round of edits. Needless to say final testing could have picked up on the issues. During email production process often team members work on the same campaign concurrently. For instance copy writing and design are happening at the same time. Sometimes the final version of the copy doesn’t make it to the designer in time. And the email programmer is setting the html based on design files that don’t contain the final copy. The result is that final copy only arrives after the email has been set. During the review process one assumes the copy is correct, and reviews the layout only. 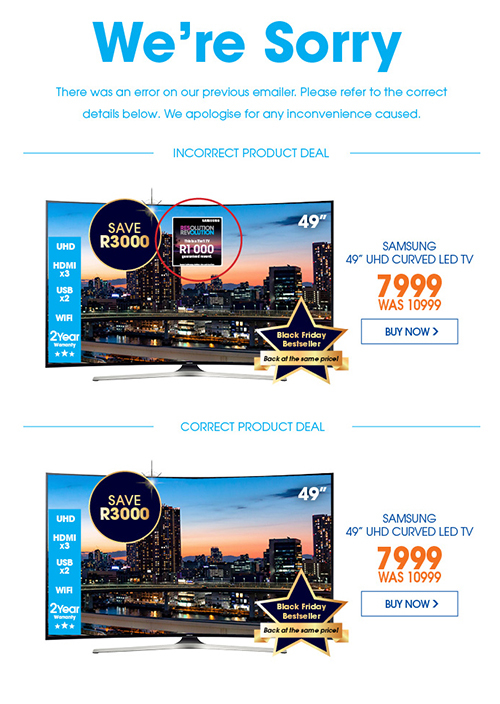 The campaign sends with the wrong information. and ensuring the Alt tag for each image makes sense. The alt tag displays in place of the images or while the images are loading. Very important for recipients that choose not to download images automatically. Render testing will pick up issues with the layout of an email in the different email programmes. It is worthwhile to do render testing to pick up issues that affect user experience of your email campaign. Generally speaking what’s done is done. But if your ESP allows it, and if your email campaign has not finished sending, you can pause the campaign and fix the mistake and continue sending. Then double back to see what can be done about the incorrect emails that were sent. Here are some options for how to fix and recover from email campaign errors. Triage for email campaign mistakes. Paramedics arriving at the scene of an accident do triage and assess the injured. 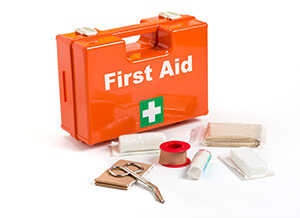 They plan their first aid according to the severity of injuries. If the mistake has minimal impact, and the recipients perceive it is obviously an error, then it don’t do anything. Sending an apology mail is more than likely going to blow the whole thing out of proportion. The word “Test” included in the subject line counts as one such example. An email invitation to a cricket match sent out with the word “test” still in the subject line. The embarrassed campaign coordinator decided no action was necessary. The invitation was to a test cricket match and most people wouldn’t notice. When the same email sent too many times though, it may be worth an apology. There was a grocery store that sent the same email for discount coupons 26 times to their mailing list. They followed up with an apology email with the subject line “Sorry we just really love coupons”. This recovery humanised them and made the whole situation humorous. 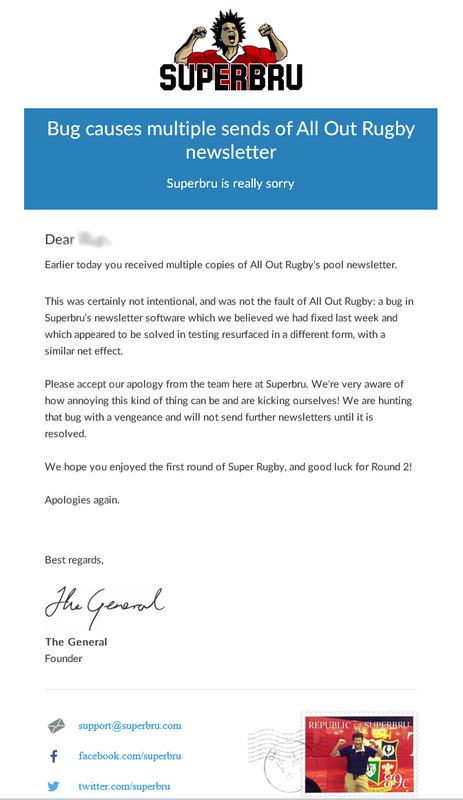 It is a good idea to have an apology email template ready. This will save time and reduce stress so you are free to concentrate on the copy and sending of the apology email. Depending on the context a sincerely worded email from the CEO of the company is appropriate and is a safe default to fall back on. Can you fix the error after the send? Depending on the error see what is possible to fix. For instance if it is a broken link you could get your web team to use a redirect to route the traffic to the correct page. If it is an incorrect image you could replace the image with the corrected image. You could change wording on the page the email is linking to. An invitation to an event in Johannesburg was mistakenly sent to a mailing list of recipients residing in Cape Town (1200 km away). Once the mistake was identified the event manager was informed and brainstormed with her team to decide how to handle the mistake. The event was going to be held in both cities anyway so the team resolved to update the landing page. Due to popular demand the event will now be held in Cape Town, invitations will be sent shortly. Confusion was averted and the organisation even came off looking responsive to the needs of their clients. Do you need to do more damage control? Often times it is only a fraction of the email subscribers that will be aware of the error. Look at the metrics. If the open rate is 25% then that is the percentage of folks that could be aware of the error. Do the effects of the error need to be managed by customer service teams and call centres? If yes then communicate so they can respond appropriately to the queries received. Sometimes comments on social media bring the mistake to light. Responses to these can be handled individually so as not to blow it out of proportion. Tell us your email campaign mistake story, we would love to hear about it – share your story in the comments field below.